The Duchess of Kent was the first member of the British royal family to give birth in a hospital. Lord Nicholas Windsor was born at King's College Hospital on July 25, 1970. The Duke of Kent was not present for the birth as he was commanding a squadron of his regiment, the Royal Scots Greys, in Cyprus. The Greys were a part of the United Nations forced based on the island. The Duchess telephoned her husband shortly after giving birth. The Duke and Duchess of Kent's first two children, George, Earl of St. Andrews (1962) and Lady Helen Windsor (1964) were born at Coppins. Only three days after giving birth and still in the hospital, the Duchess of Kent's post-birth engagements were already being scheduled. It was reported on July 29 that the Duchess and her newborn son were "making excellent progress." The Duchess and her newborn son left King's College Hospital on July 31 and returned to the family home, Coppins, in Iver, Buckinghamshire. The Earl of Ulster, the first child of the Duke and Duchess of Gloucester was the second royal baby born in a hospital. The Duchess gave birth on October 24, 1974 at the Lindo Wing, St. Mary's Hospital, Paddington. Alexander was born two months premature and delivered by cesarean section The Duchess and in her infant son were said to be in satisfactory condition. As she had suffered an earlier miscarriage, the Duchess was advised to rest during this pregnancy. Her last engagement was in April 1974. Two days after the baby's birth, a statement from the Duke of Gloucester's office noted: He's done as well as he can and his condition is satisfactory, but he is only half way there yet." On October 28, the Times reported that the Duchess' condition was "excellent" and her son was "showing signs of improvement." The Duchess of Gloucester, accompanied by her husband, Richard, left St. Mary's Hospital on November 3. Alexander remained in the hospital for a few more weeks. Getty does not have photos of the Duke and Duchess leaving the hospital, but there is a photo in November 4 issue of The Times. The Lindo Wing was also the place of birth for the two daughters of the Duke and Duchess of Gloucester. Lady Davina was born on November 17, 1977, two days after Princess Anne gave birth to her first child. The Duchess of Gloucester and Lady Davina went home to Kensington Palace on November 26. Lady Rose was born on March 3, 1980. Mother and daughter were released from St. Mary's on March 8. Getty does not have any photographs of the Duke and Duchess of Gloucester leaving St. Mary's with their children. Lord Ulster spent some weeks in the hospital before he was released. Princess Anne's two children, Peter and Zara, were born at the Lindo Wing, on November 15, 1977 and May 15, 1981. A nurse carried Peter Phillips out of the hospital and handed him to Anne when she was seated in the car. Anne carried Zara out of the hospital. Lord Frederick and Lady Gabriella Windsor were born at the Lindo Wing. Lord Frederick's birth took place on April 6, 1979. No announcement in The Times as the newspaper was not published due to a nearly long strike. Lady Gabriella was born on April 23, 1981. St. George's Day. The two sons of the Prince and Princess of Wales were born at the Lindo Wing. 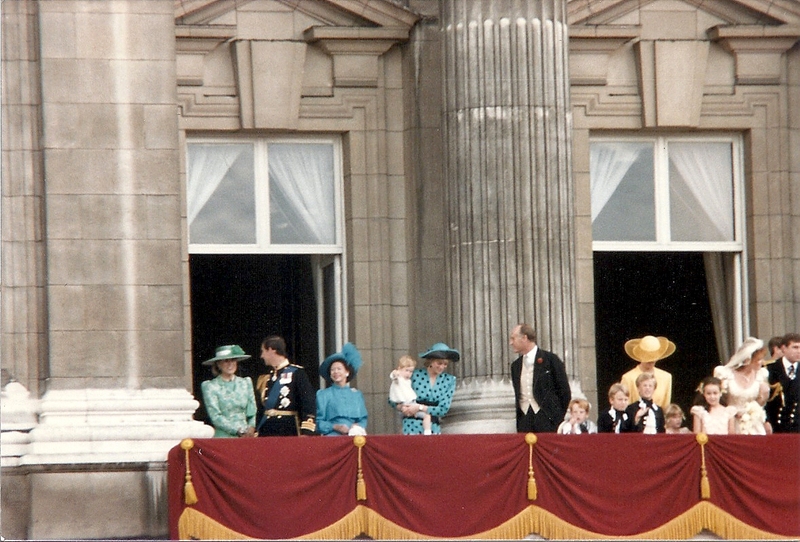 The Duke of Cambridge's birth took place on June 21, 1982. The Duke of Sussex's birth was on September 15, 1984. Princess Beatrice and Princess Eugenie of York were born at the Portland Hospital in London. The Duchess of York gave birth to Beatrice on August 8, 1988 and Eugenie on March 23, 1990. With the exception of the Duchess of Gloucester, the Duchess of Kent, Princess Michael of Kent, the Princess of Wales and the Duchess of York all returned to royal duties within a month to six weeks of giving birth. Maternity leave was not subject of conversation until relatively recently. The Countess of Wessex suffered an ectopic pregnancy in December 2001. On November 8, 2003, the Countess was rushed to Frimley Park Hospital where she gave birth prematurely to a daughter, Lady Louise, having suffered a placental abruption, which lead to a cesarean birth. Their son, James, who bears the courtesy title Viscount Severn, was born at Frimley Park Hospital on December 17, 2007, also by cesarean. The Duke and Duchess of Cambridge's three children: Prince George (July 22, 2013), Princess Charlotte (May 2, 2015) and Prince Louis (April 23, 2018) were born at Lindo Wing. Prince Louis and Lady Gabriella were both born on April 23 at the Lindo Wing, thirty six years apart.